Where do I begin? Our five-year wedding anniversary trip is over and we are now back home in good ol’ Alexandria, Minnesota. We ran our second half-marathon, we drank lots of wine, we ate good food and oh, so much more. I have so many great memories of our trip to California…the time spent with my amazingly awesome husband, the scenery, the wineries, the weather, the food, the walks, the talks, the people, the wines and of course, THE race. The photo below, captured by a MarathonFoto photographer, says it all. Well, if you know the story behind it, that is! It may not be the best photo, but it still brings tears to my eyes. And you can’t necessarily see it in this photo, but I was sobbing at this point. Let me back up a little. I love running to music and a couple of weeks before the race, I asked my son, Brandon, to make me a playlist of songs. I said I wasn’t picky and that I just wanted fun, upbeat, up tempo music to run to. The only requirement…it couldn’t include rap…well, not all rap. I was open to pretty much anything else. I never got a playlist from him. And, I will admit, I was a little irked at first. UNTIL, he explained to me that it was kind of a lot of pressure and that he didn’t want it to be his fault if I ran slow because of the music he picked. Totally didn’t think of that, but after he explained it, it made TOTAL sense. I was no longer irked. Now keep in mind, I had 56 different songs and when I hit “play,” I hit shuffle. There was no particular order to my music. I just listened to whatever came next. 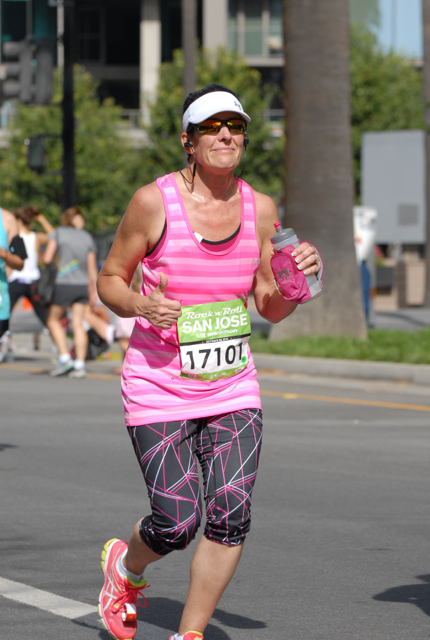 Now, fast forward to about mile 10, when I started getting pretty tired and kind of, somewhat, delirious. I had all sorts of thoughts running through my mind. Runners do this. Just ask my husband, or better yet, read his opinion column that was in the Friday edition of the Echo Press! For some reason, I was really thinking about my sister, Donna, who passed away from breast cancer nearly three years ago. I thought about how proud of me she would have been for running, as well as how crazy she probably thought I was for taking up the sport! Donna always supported me, no matter what I was into and no matter what I was doing. I know my other five siblings also support me and are proud of me, but Donna and I just had this thing, this bond. Sometimes, I feel bad for that. I really do. Anyway, as I was running, I was thinking about how cool it would have been to have her there cheering me on, but then I thought, you know what, she is with me. She’s always with me because she is forever in my heart. I know my sister, Karen, has “felt” Donna’s presence from time to time and things have happened that make her know Donna is “there.” I’ve always been a little jealous of that, but at the same time, fearful. I have to be honest with you here, I am not the biggest believer of spirits or “that” kind of stuff. You know, GHOSTS! But I tell you what, I am now a believer. I kept listening. I kept running. I kept getting closer to the finish line. Right before the voice in my earbuds announced, “mile 13,” Miley’s voice came through loud and clear and “The Climb,” started playing. I lost it. I couldn’t hold back. The tears just flowed freely. I sobbed – almost uncontrollably. It was the moment I wanted, needed. It was exactly what I knew would get me to the finish line. And it couldn’t have been more picture perfect or more “Lifetime” movie-like. It felt like I was running in slow motion. I felt alone, but yet I knew I wasn’t. Donna was there – well, along with the hundreds of spectators lining the streets. It was the most surreal moment I have ever had in my life. Almost unexplainable. The second the song was done, I shut my music off. I didn’t need to hear anymore. I didn’t want to hear anymore. And within seconds, or what felt like seconds, I crossed the finish line. My pace, which was at a 14:06, dropped to an 11:54 during the song. It was my only negative split during the whole race, which means my pace dropped and I ran faster than the previously recorded time. Within seconds of crossing the finish line, I spotted the only familiar face in the crowd, my husband’s. I couldn’t have been happier to see him at that very moment. He grabbed me, hugged me tightly and once again, I sobbed like a baby. This is another shot that the photographer got of “THAT” moment. Whoever it was has no idea how much this means to me. Thank you, Marathonfoto. Stay tuned this week for more about our trip, including TONS of pics. If you want to see pics now, check out my Facebook page. You amaze me and inspire me Celeste! 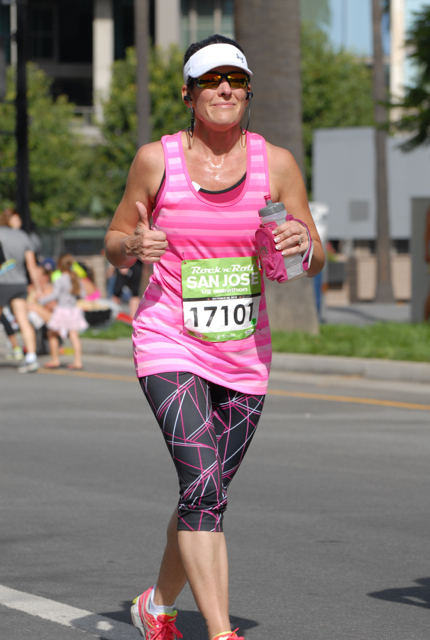 I wasn’t sure I would ever want to run another half marathon but reading your blog brought me back to the amazing experience I had while running mine too. I too, was moved to tears several times. I also bawled like a baby every time I saw my son running his full marathon last month. It is an emotional experiecne. Keep on running! The Climb is a must play on the playlist my daughter made for me on her old ipod. I love it – it inspires me so often – and now it will even more. Thanks for sharing your story. You are an inspiration to so many! What a great story! I just put The Climb on my running playlist, I will think of you and your sister every time I listen to it. You are truly an inspiration, keep up the good work. Congratulations on completing another half marathon! LOVE this story and love this pic, Celeste! Donna was absolutely there with you, every step of the way! Congrats on a fantastic race! I am so proud of you! Previous Previous post: Is this weird? Next Next post: More about the race!